You don’t need to replace your marble when it becomes dull-looking, stained, chipped, damaged and dirty. By combining proven, modern restoration equipment and our years of experience, with Tile Cleaners Sydney® you can enjoy your marble in its best possible condition! Honing your marble is a fantastic way to virtually eliminate taxing maintenance requirements while still having the wonderful characteristic of beautiful stone surfaces in your home or business. Honing removes a stones polish, resulting in your marble attaining a matte finish. Etch marks, scratches are less visible, and slip resistance is increased in wet areas. 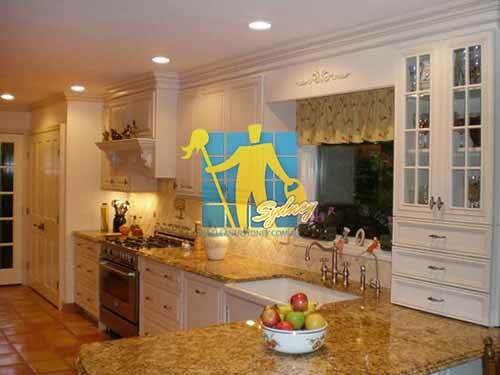 Tile Cleaners Sydney® technicians skilfully hone marble, granite, sandstone, limestone and travertine. Honed marble has a more satin-feel, smooth and velvety to the touch often more suited to casual, comfortable environments than more formal polished surfaces. Honed marble is also highly scratch resistant due to the lack of a glossy surface and when your honed marble does become scratched, the damage is not obviously reflected. Honed marble is popular in areas of high foot traffic and regular use including floors for the bathroom, living rooms, foyers and kitchen counters. How do we hone your marble? Honing is achieved by mechanically resurfacing your marble using weighted diamond abrasives and water to obtain a uniformly honed surface sheen, creating a look that is low key and not too overwhelming as some people find with highly polished, glossy marble. Honing your marble can resolve issues with stains, chips, water spots, glass rings, cracks, etching and dull spots. Tile Cleaners Sydney® specialists create a surface with a beautifully smooth, low sheen matte finish. Resurfacing is an extremely skilled task that requires patience and experience. If not done properly and to the right depth it may only enhance the scratches and impurities. Give us a call today on 02 9386 5522, our knowledgeable and friendly customer service can assist you with all your questions and bookings. Our team utilise the most modern equipment, restoring years of wear and tear, bringing even the most tired and damaged marble surfaces back to life! 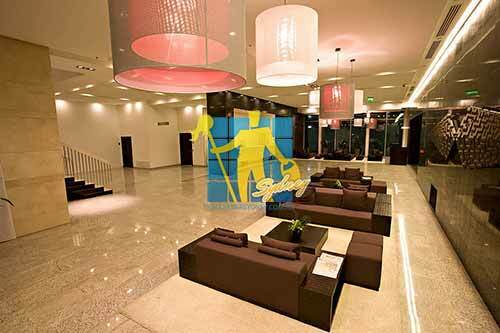 We offer complete marble restoration services for Commercial and Residential Premises. With our expertise and modern equipment, having your marble restored today is more affordable than ever. Let our experts fix the damage! Marble is a natural material and a relative of limestone which requires special care both because of its high value and because it is unfortunately prone to scratching and staining. Marble is porous and will absorb liquids and oils, leaving stains under the surface that can be very difficult to remove. The acidic nature of many substances around the house can instantly etch the stone. Fruit juice, sauces, soft drink and acidic cleaning products coming into contact with marble puts it in danger of permanent staining. All natural stone needs some type of care and maintenance. We know marble and understand and appreciate its distinct characteristics, providing the specialist care your surfaces deserve. Our passion for what we do and our strong commitment to educate our customers on proper care and maintenance is evident with every job we perform. 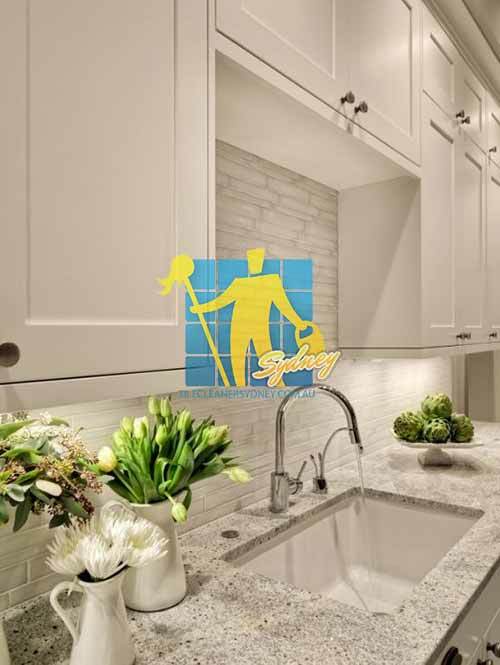 Sealing your marble keeps most stains suspended at the surface, creating a barrier that provides protection against chemical attack, deterioration and contamination. Sealing is the first important step towards protecting your marble against stains. 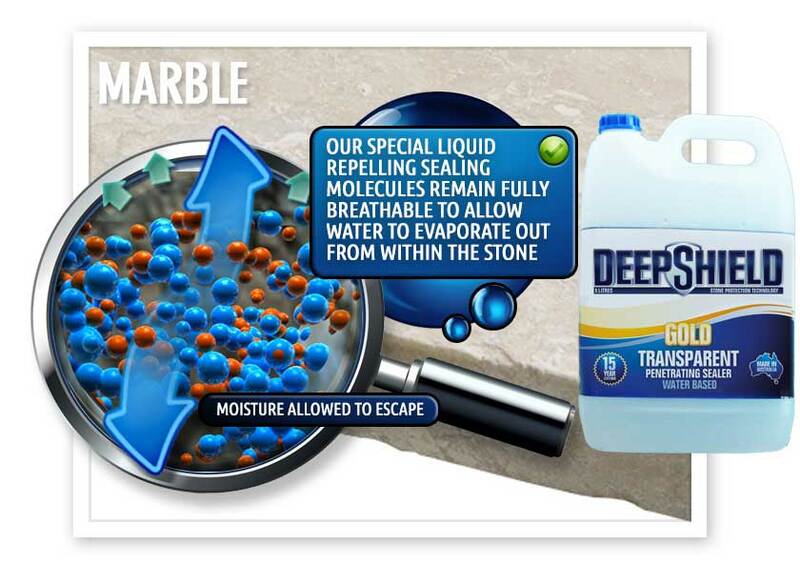 Deepshield™ GOLD ultra premium sealer with up to a 15 year lifetime is specially designed to penetrate dense materials such as marble, granite, bluestone and porcelain, offering peace of mind by forming a barrier between the micro pores of your marble and water and oil based stains. A deep penetrating impregnating sealer protects your marble against water and oil based stains by chemically reacting with the stones surface pores. 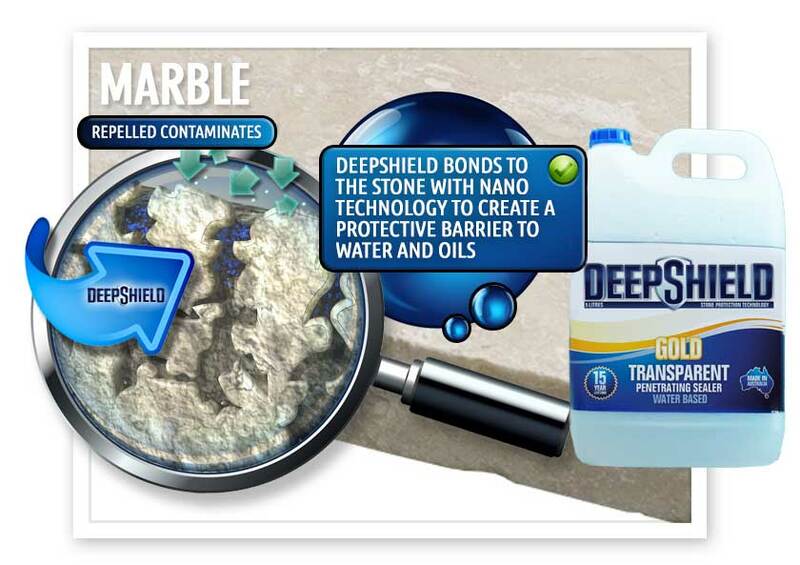 Deepshield GOLD® prolongs the life of your marble by taking full advantage of recent advancements in nano-technology and fluoro-bond technology, forming a bond with your marble that is stronger than any mechanical or hydrogen bonding of conventional film forming sealers. 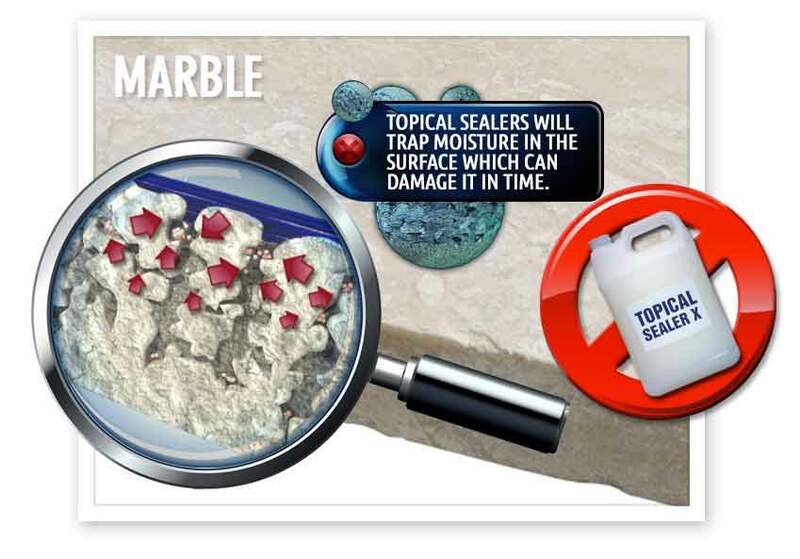 A penetrating impregnating transparent sealer enters the pores of your marble and, once cured will not affect the texture or appearance, providing unmatched long-term stain resistance and reliability while also resulting in cleaning and maintenance becoming much easier..
Tile Cleaners Sydney® technicians are experts at applying all types of sealer and will ensure your marble looks its absolute best. Tile Cleaners Sydney® can apply a topical sealer when especially required to create a high gloss, satin sheen or matte finish to your marble surfaces. Topical sealer is also helpful in situations where an old solvent based sealer can not be completely removed or when required to hide certain types of damage. Topical sealers have a life expectancy of 3-5 years. You can easily test how porous your natural marble is by applying a drop of water to the surface and watching how it is absorbed. You can then see how any type of water based stain can be absorbed by the marble tile surface and grout. Using state-of-the-art equipment, our unique cleaning methods tackle even the most difficult floors. Our equipment can handle both domestic and commercial jobs, leaving your floors spotless and hygienic. Serving all of our new and existing clients with timely, flawless and hassle-free marble restoration services, we have earned our reputation for quality in the flooring industry. Marble is one of the most beautiful natural stone surfaces, however, being a fairly soft stone it can easily become scratched in areas of high foot traffic. A regular maintenance program is vital if marble is to retain its original beauty. Special care is required when cleaning marble. Unsealed or weakly sealed marble will soak up oils, spills, and stains. To check whether your marble is sealed, leave a few drops of water on the surface. If after a few minutes the water has soaked into the marble, then it's time to reseal. Don't allow an accident to permanently stain your beautiful surfaces. Sealing is the first important step towards protecting your valuable marble against stains. Spills should be cleaned immediately. You should generally use only warm water and a mild detergent on your marble floors and never use vinegar on marble. The acid in vinegar can seriously damage and actually etch and remove the surface shine. After mopping, dry the floor with a cotton towel or use a sh-mop to remove the moisture and prevent water spots. 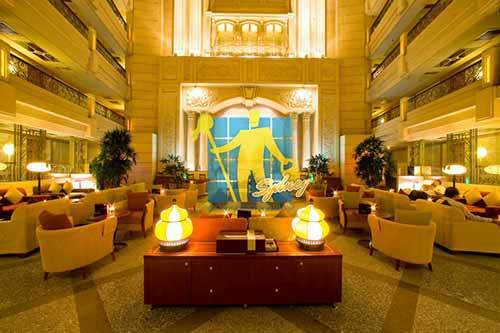 Always dry your marble floors as they spot very easily. Q: How long will it take to hone my marble? Q: Will honing remove the sealer from my marble? Q: Do I need to apply a sealer to my honed marble? Q: Is honing marble a messy process? Q: Can honing damage my marble?